Mid-Life Cruising!!! : Love With A Chance of Drowning - Worth the Read? Love With A Chance of Drowning - Worth the Read? 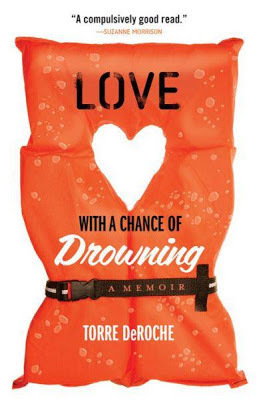 When I found a copy of "Love with a Chance of Drowning" in our mailbox to read and review, it felt like Christmas! I'd heard about this book from the author, Torre DeRoche, in a Facebook group that we're both a part of, Women Who Sail. It's a group for women that are sailing or learning to sail, and it's a place to share our experiences, our questions, and our fears. When Torre mentioned that she had written her true story about falling in love with a man who wanted to sail across the Pacific ocean, I was intrigued. I've never been a fan of romance novels, but this sounded like much more. Not only was this about cruising on a sailboat (that was good enough for me), but it was also about Torre's fear of the water and having to make a tough decision. Torre could either face her fears and head into the ocean on a sailboat with her man (and surely die!) or watch him sail away without her. I knew from the description of the book that Torre had chosen love over fear, but I wondered how things turned out. Would she regret her decision, or would it be one of the best experiences of her life? I immediately started enjoying the book, and Torre's style of writing made me feel like I knew her. She has a great sense of humor, and her book was honest. One of the first challenges Torre faced when taking a risk and living a lifestyle that is foreign to others happened before she ever left the dock! Torre not only had to fend off her own negative thoughts about cruising ... but those of others. I could totally relate to her experience. In fact, I'm bracing myself for more of this as our departure date gets closer. I guess it's just yet another of the challenges that we face when choosing an alternative way of life. Facing her fears and living on a sailboat wasn't always easy for Torre, and she wrote about the difficulties that came with her decision. Sometimes she loved cruising, and sometimes she didn't. She also wrote about her clumsy boyfriend, and some of their embarrassing stories that made me laugh out loud (literally). I'm sure we'll have our own share of embarrassing stories once we start cruising, and it was refreshing to read about such things. Life shouldn't be taken so seriously. That's what was so great about this book. The book didn't end quite the way I thought it would, but that's because this is real life! Without giving away too much, let me just say that I highly recommend this book. Whether or not you're into sailing, you're sure to enjoy it. I think Torre's story is not only a good read, but a source of inspiration. We all have fears, and sometimes they get in the way of our dreams. Torre wasn't going to let her dream of a future with her new love be crushed by her fears. Facing her fears changed Torre ... and her life. Heck, Torre's life changed when she left her home in Australia (yep, I hear she's got one of those awesome Australian accents) to experience the United States (San Francisco). She didn't really know anyone and didn't have a job when she first arrived. That in itself takes guts! It was in San Francisco that she met her new love. That chance meeting led to sailing and this book. I hear there's already a movie deal! Just goes to show what's possible when we step outside of our safety net. What a great book review you did. Sounds like a great book indeed. Sounds interesting, i will have to see if I they have an ebook format. I hope Ken is doing ok.